Joe Stutz, III and Joe Stutz, Jr.
display their 1931 Model A Ford. With roots dating back to Centralia over 90 years ago, Joseph J. Stutz Funeral Home has been handling needs of mourning families for three generations. Joseph J. Stutz, Sr. started Joseph J. Stutz Funeral Home in Centralia after earning a degree in mortuary science from Eckles College in 1919. Following directly in his father's footsteps, Joseph J. Stutz, Jr. joined the business in 1951after receiving a degree in mortuary science from the same college his father attended. Joseph Jr. began to overssee daily operation in 1960 after his father passed away. In September of 1971, Joseph Jr. purchased one of the oldest funeral establishments in the coal region, Higgins Funeral Service. Higgins Funeral Service had operated its business in Mt. Carmel since 1886. Joseph Jr. renamed the Mt. Carmel location to Joseph J. Stutz, Jr. Funeral Home as he had done with the Centralia location in 1960. The Centralia location remained in operation until it was closed in 1986 as a result to the Centralia mine fire. In 1985, Joseph J. Stutz, III received a degree in mortuary science fron the Simmons School of Mortuary Science in Syracuse, New York. After serving his internship with his father, Joseph III received his funeral directors license in 1987. 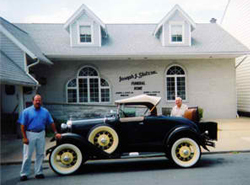 In 1992, Joseph J. Stutz, III purchased the business from his father and it was renamed the Joseph J. Stutz, Inc. Funeral Home. Joseph J. Stutz, Inc. Funeral Home offers a variety of service and sepecializes in pre-planning needs.